Today is my sister Lindi's birthday. She is celebrating by relaxing at the beach. She is currently about 34 weeks pregnant, and feeling appropriately exhausted, I think. We celebrated her birthday with the family last Sunday with my first vegan (for Lindi and her husband Mike) and gluten free (for my mom) coconut cake...it was dry. I'll try a different recipe next time. One year ago, we were getting ready to celebrate her birthday when all of our lives took a turn. Once year ago today was my last day of work. One year ago today, Lindi was admitted to the hospital, in labor at 22 weeks (just 5 months) pregnant, and one year ago tomorrow, we lost baby Zoey. Lindi has written about her experience on her blog, and has given me permission to write about it here. It's a very difficult subject, but, like everything else we have experienced in the last year, she tells others so to bring awareness. I was in a staff meeting after two consecutive days of back-to-back conferences (25 sets of parents in 2 days), preparing for my maternity leave to begin in just two days. My phone had been ringing in my purse all during the meeting, but I ignored it, assuming it was my sister or mom wanting to make plans for a birthday dinner. It could wait. When I finally looked down, I saw a text from Chris saying "Call you mom or sister NOW." I immediately called my mom, who was obviously upset. She was sitting in the doctor's office with Lindi, waiting for the doctor to return with results. She said that Lindi was dilated and not feeling well, and that things weren't looking good. As she explained, the doctor came back in the room in tears, and I could hear the fall-out over the phone. Lindi was being sent to the hospital. I grabbed a few papers from my mailbox and went directly to my car. I drove as fast as I could, illegally in the carpool lane, making call after call. Dad told me that he was on his way to the hospital, and I should meet them there. Just weeks before, we had toured the hospital in preparation for Scarlett's birth, so I knew exactly where to go. When I got upstairs to the room, the first thing I did was volunteering to leave. I didn't want her to see me, nearly 9 months pregnant, while she was in labor with a baby she could not keep. She told me to stay, and we cried. The rest of the night cycled through with crying, talking, laughing over inane things and silence. We cried as we listened to Mike, stuck in an airport in New York, unable to get home in time, trying to understand what was happening through phone calls and texts. All the doctors really knew was that she went into labor for no apparent reason, and the baby was too undeveloped to survive. By the time she realized something was wrong and got to the doctor, she was too far along for them to stop labor, already 6 cm dilated. There was simply nothing they could do. Lindi had to continue through the labor process and deliver the baby, and there was no chance that the baby could be saved. Lindi was so calm. She came to terms with everything very quickly, which I think is the only way she was able to get through it all. She had done nothing wrong, and there was no cause; this baby was just not meant to be. Two weeks earlier, they had found out they were expecting a girl and had given her the name Zoey, which Lindi had liked for years. They had just begun choosing items for a baby registry, found a few cute outfits to hang in the closet and begun to call her ladybug. The night went on, and we congregated in the hospital room, nurses ignoring the room capacity and allowing us to do what we needed to do. They checked in regularly to give pain medication and check her progress. At one point, as a few of us stood in the hall, we remembered it was Lindi's birthday. It was getting late, maybe 10 pm, and we were afraid she would deliver the baby on her birthday, forever marking that day with sadness. We asked the nurses to please not rush, to try to get her to the next day. They said they couldn't do anything but let her labor at her own pace. I don't think it would have really made a difference which day. Around midnight, the majority of us left. I was too tired to be any help. My mom, Mike's mom and a friend stayed overnight. I got a call early the next morning that it would not be long, and to come back. When I tried to enter the hospital, the security guard asked why I was there before visiting hours. It was the first time I had to talk to someone outside the family, and all I could say was "My sister is having a baby." It was painful to say, but he let me through and I headed upstairs, where Lindi was ready to be done with labor. It had been more than 12 hours of full-blown labor, knowing that the pain would not end in a reward. A short time later, the doctor arrived. The hospital worked with on-call doctors, and that days on-call doctor was none other than my OB-GYN, whom I had seen earlier that week. When she walked in to see Lindi, then saw me sitting in a chair, she stopped short, looking for an explanation. All I could saw was "This is my sister." She gave a pained look and continued to her new patient. Just a few minutes later, it was time. I thought I was going to be okay, but as soon as the doctor began to gown and prep, I began to cry. Since she was my doctor too, she was concerned that it was too much stress for me, and asked me to leave. I couldn't argue - I was no support as a crying mess. I hugged my sister and walked to the waiting room where I sat with my dad, unable to saw more than a few words. It only took a few minutes. Zoey was born at one pound, one ounce. We were invited into the room, where my sister was holding her in her arms. She was tiny and fragile, barely moving. Mike was on the phone, and spoke a few words to his daughter over the phone, still stuck in the airport across the country. We all took turns crying softly, except Lindi. She just admired the baby, looked at her features and gently stroked her. It was her baby, no matter what. After a while, she was ready to hand her child over to the nurses, who would keep her nearby until Mike could get there later that night. Lindi needed to rest, so those who had stayed overnight went home, and Chris and I stayed in the hospital. After a few hours, a nurse came in to tell us that they needed to take the baby to the morgue, and that Lindi needed to sign a death certificate. This cause panic in the room, as we were expecting her to stay on the floor (I am not sure where) until Mike arrived, and for him to be there when anything more happened. We started yelling and crying, and the nurse, whose English was not very strong, tried to explain. She left, and another nurse came in and said, "Are we having a crying party?" This set us off. Lindi started yelling. I started yelling. The nurse was not sure what she had done, but knew to get out fast. We had the pager number for another nurse who had lost her own baby years before, and had been kind and patient with Lindi while she was there. We called for her to come, that we needed help. She rushed in and we both broke down again. Nurse Nahdra was wonderful and went straight into action. She stood guard at the door and would not allow anyone else in without her approval. She brought the nurse manager in to explain that they would take Zoey, but nothing would happen and they would bring her back as soon as Mike arrived. No papers would be handled until he arrived. She got us Lindi moved to a corner room that was isolated from the rest of the ward, so that she would not have to hear the cries of new babies through the walls anymore. Nahdra had herself assigned to Lindi, and did not allow any other nurses to come in. We were so grateful for her. The rest of the day passed uneventfully. As my sister rested and Mike was in flight, I made some uncomfortable phone calls to family and friends. My mom and I discussed later how saying what needed to be said was difficult, and we had not done it very well. Giving bad news to unsuspecting people was an awful feeling. Little did we know it was just a dry run for what was coming with Scarlett in just a few months. We learned later that there was nothing wrong with Zoey, no reason she could not have made it to full term. She would have been a healthy baby. While many people call it a miscarriage, Lindi prefers stillborn to honor the fact that her child was born. The hospital and state, however, did not consider this. They only issued a commemorative birth certificate, but an official death certificate. After the stress everyone in my family had been under, Chris and I spoke with my doctor, and she agreed that scheduling an induction was a good idea. It gave us some control, and allowed us to plan for the least stressful birth experience we could. Once of my biggest fears was being in the same room that Zoey was born in, so we were able to specifically ask for a different room (Scarlett was born just down the hall from her cousin). As difficult as the entire ordeal was, it brought my sister and I a little closer. She was there by my side two weeks later as I delivered Scarlett in the same hospital, and was a wonderful support, despite how difficult it must have been. She was there with us when Scarlett was diagnosed a short time later, and as we walked the halls of the hospital, passing new mothers carrying their brand new babies, I felt a tinge of what she had felt, seeing someone else beginning a journey that was being hijacked from me. Luckily, Lindi and Mike have baby Caleb to look forward to on this sobering day. This image was created by Carly at The Butterfly Beach. 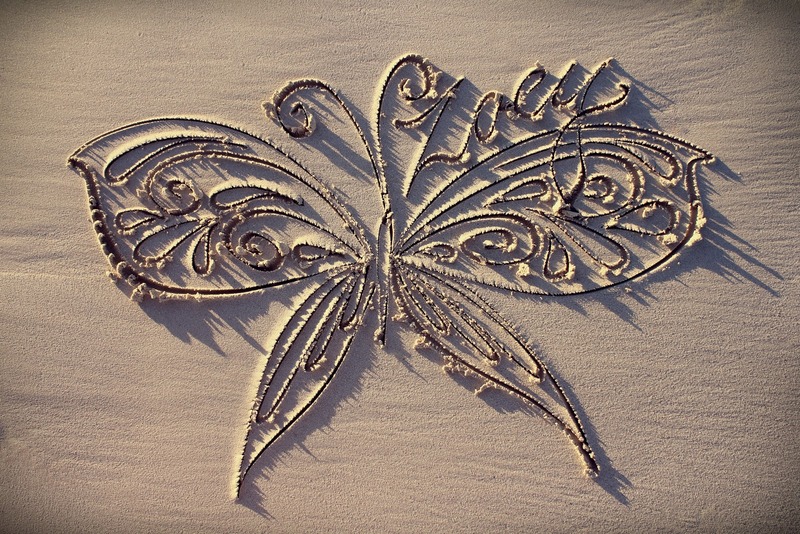 She honors babies that have passed away by drawing them a butterfly on the beach near her home in Australia and letting it be washed away by the waves. I have tears in my eyes as I read this at work. I would love a link to your sister's blog if it is public. She will be in my prayers as well as you guys. I started reading your blog in the beginning. I'm beginning to think that God was trying ot get me ready. My mom was diagnosed w/ stage IV glioblastoma in July. I took her to the ER that day and I coudln't get your story out of my head. Oh Lindi, I am so, so sorry for the loss of sweet Zoey. May she watch over her Mama and Daddy for the rest of your days. Hugs and Loves from me to you. Long time reader but this is my first comment. I am in tears reading this.. these "anniversaries" of painful events are so hard :( I have my own painful anniversary coming up in 3 months and I am already in tears at the thought of it. Fortunately my daughter was born healthy but I nearly died in the process, my heart stopped and I required 55 units of blood transfused. Then I had a pulmonary embolism. To save my life they had to perform an emergency hysterectomy. I spent the first 3 weeks of my daughters life away from her in the hospital. Many prayers for your family! Wow this is the most heartfelt story. My heart goes out to your family and your sister. I too have lost a baby although it was much earlier in my pregnancy. I could not imagine having to go through the delivery for such little gain. Your sister must be an amazing women to be able to go through that and get back on the "horse" again so soon. Congrats to them on the expected bundle of joy! I wish them all the best and that Caleb is a strong healthy baby! Thank you for sharing your sisters story! Wow, I totally should not have read this as I sit, 7 months prego, sobbing at my desk. I'm so incredibly happy that your sister is having a healthy pregnancy now and feel so bad that she had to experience this intense pain of losing a child for no reason. I think that is just the worst part of it. There was no reason, no explanation. Horrible. I'm so sorry any of you had to experience that. I'm so very sorry for your loss. Blood Drive Appointments are Live!